Intimately involved with the development of the English Arbitration Act at various stages, the authors of this book have provided the first up-to-date publication of the Act with a detailed, non-English language commentary. Enacted in June 1996, the 1996 English Arbitration Act only came into force on 31 January 1997. 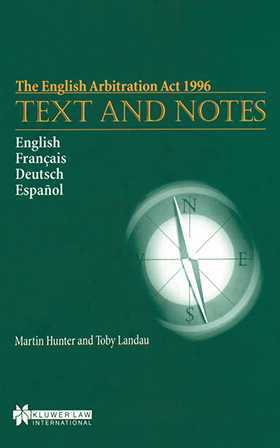 Unlike other materials published or prepared before the Act's effective date, this book is current to January 1998 and takes account of the very significant, last-minute decision to remove the distinction between international and domestic arbitration in English law. The authors present the material in English, French, German, and Spanish, with each version consistently arranged for easy access. Arbitration experts from the relevant countries prepared the translations under the guidance of world-renowned leaders in the field. The authors have conveniently set out the commentary in footnotes on a section-by-section basis. Through The English Arbitration Act 1996: Text and Notes , the reader gains an invaluable opportunity to study this important and complex legislation in his or her own language with current, expertly-authored guidance. Preface. The Arbitration Act 1996. La Loi sur l'arbitrage de 1996. Schiedsgerichtsverfahren aufgrund eines Schiedesvertrages. La Ley de Arbitraje de 1996.